Karen came to the Atlantic City Seafood Festival last summer. She created this ocean piece using a basic fish image which was duplicated and passed out to children coming through the festival. The fish images took on many different colors and patterns as the children colored them with permanent magic markers right there. During the two days at the festival the piece took shape. 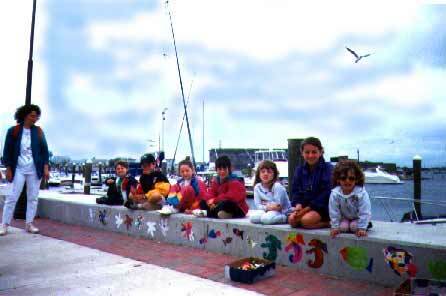 The picture below is from June 1997 in a return visit to the festival using Karen's idea with fish images from the Saint Bartholomew School in Chicago, Illinois.